Rapid and accurate diagnosis is crucial in ensuring the needs of people living with MND are met from the earliest possible stage. A new diagnostic tool highlighting MND ‘red flags’ has been developed for GPs by MND Australia and will be launched during MND Week, 1-7 May 2016. Painless, progressive weakness – could this be motor neurone disease? aims to assist GPs in their referral to a neurologist thereby speeding up the time to an accurate diagnosis. Adapted with permission from the MND Association of England, Wales and Northern Ireland, the Australian version of Could this be motor neurone disease? outlines MND signs and symptoms including bulbar and limb features, respiratory and cognitive features as well as supporting factors that point towards a diagnosis of MND. GPs can download the red flags diagnostic tool from the MNDcare website www.mndcare.net.au. CLICK HERE for the Red Flag Diagnostic tool. All MND enquiries can be made to: 1800 777 175. 1. Andersen PM, et al. Eur J Neurol 2012;19:360-375. Iron deficiency is a common cause of anaemia. In Australia current clinical management recommends use of oral iron as first-line therapy for most patients presenting with IDA. However, oral iron therapy may be of limited benefit to some people, including those with impaired intestinal iron absorption or who experience GI side effects that reduce adherence. Oral iron therapy may also be inappropriate in cases of severe IDA, in which rapid iron repletion is required to prevent physiological decompensation or the need for blood transfusion. Intravenous iron administration may be an alternative in these patients. To assist General Practitioners, BloodSafe eLearning Australia (BEA) has developed and released a video on IV Iron administration in primary care. You can find the video in the videos page of their resources section. The BEA program develops eLearning courses and resources that influence knowledge and provide consistent educational messages to a variety of health care workers and professionals. It is supported by all Australian Governments, the National Blood Authority (NBA), the Australian Red Cross Blood Service (Blood Service) and the Australian and New Zealand Society of Blood Transfusion (ANZSBT). Lifeline Australia is providing skill training in recognising, responding and referring cases of domestic and family violence. To read more or register for the 27 April session CLICK HERE. The NSW Health Statewide Domestic Violence Network has compiled a Domestic and Family Violence Resources List for use within health services. CLICK HERE for the resources list. The Asthma Foundation Referral Service is a free service for patients providing telephone asthma education, support and follow up by the Asthma Foundation’s Education Team in Sydney. Patients with asthma can be referred by their general practitioner or practice nurse. CLICK HERE for the Asthma Foundation Referral Service. A new four-strain flu vaccine, protecting against the nasty Brisbane virus, is being made available for at-risk Australians for free from this month by the Australian Government, to help them build up their immunity in time for the peak flu season due in August 2016. Ms Ley said the Government had moved quickly to upgrade Australia’s flu vaccine stocks from three strains to four, after the arrival of the Brisbane flu strain last year led to 2015 being recorded as the worst flu season in years. The information sessions are also a perfect opportunity to ask questions and have them answered by experienced NDIS staff members. How to RSVP: e: nbmengagement@ndis.gov.au or call (02) 4726 4555. Please advise the names of those attending, contact phone number and any support requirements. Friends, family members and carers are welcome. Light refreshments will be available. All venues have disability access. 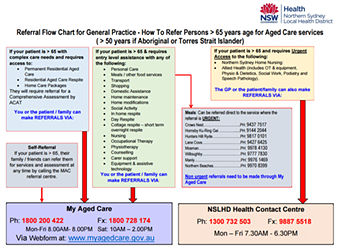 The Local Hospital District (NSLHD) has created a handy flow chart for General Practice to assist with appropriate referral of persons > 65 years age for Aged Care services or > 50 years if Aboriginal or Torres Strait Islander. CLICK HERE for the referral flow chart. The emotional toll of diabetes can make it hard for patients to reach their treatment targets, and the health consequences of poorly managed diabetes are significant. Using funding provided by the NHMRC, researchers at Sydney’s Black Dog Institute, UNSW Australia and The University of Melbourne are testing whether an online self-help program can help people with type 2 diabetes feel happier and live more active lives. General practices in NSW are invited to take part in the project. Designed to minimise interruption to daily practice activity, this is an exciting opportunity for practices to get involved in eMental health; conveniently, easily and at no cost. For each patient recruited to the study, practices will be reimbursed $50. To learn more or get involved, email springboard@unsw.edu.au, phone 02 9382 8310 or visit https://springboard.blackdoghealth.org.au. In the two years since its inception, the Agency for Clinical Innovation Pain Management Network website has been used by more than 46,000 people in 123 countries throughout the world, and continues to provide a wealth of information and support for General Practitioners, other clinicians and consumers managing chronic pain. Affecting one in five people, chronic pain is pain that persists for more than three months and doesn’t go away. It interferes with people’s lives, work and relationships. Many people with chronic pain feel isolated and alone, and that others don’t understand their experiences. Learning different strategies to manage pain is an important part of an integrated approach to living with chronic pain. Quicksteps is a decision support tool which can help General Practitioners to work with their patients to create tailored, individual chronic pain management plans. It provides a framework to direct care and guidance on contributing factors including psychological distress, medications, physical activity, sleep and nutrition. The General Practitioner and patient work together through the tool to create a guided self-management plan that the patient can develop and implement on a daily basis. New resources for consumers in different community languages including a toolkit for pain management and a five minute video translated into Arabic, Vietnamese, Mandarin, Cantonese and Greek languages. A new video series for General Practitioners to increase understanding and awareness of the resources available and how to use them in daily practice. Learn more about how ACI is working to make a difference at www.aci.health.nsw.gov.au/make-a-difference/work or visit the ACI Pain Management Network Website at www.aci.health.nsw.gov.au/chronic-pain. Has a patient under your care recently been diagnosed with a life-limiting or terminal illness? Do you struggle with how to break the news to them or how to get them to consider future healthcare treatments? The GP Hub at CareSearch provides fact sheets on how to communicate with your patients about life-limiting or terminal illness. CareSearch has released the latest Allied Health Hub newsletter featuring articles on how music therapy can assist those in palliative care. You can find more information online here, or you can subscribe here. To order hard copy resources CLICK HERE. Diabetes NSW delivers education and support to those living with diabetes. The organisation provides coverage across parts of Sydney and the Hunter and Central Coast. GPs can recommend the service to their patients. Patients can self-refer to the service by calling 1300 136 588 to secure their position. CLICK HERE for the calendar of Diabetes Education events from April till June 2016.